I have always believed that things should flow organically in life. There is a natural rhythm to life and our path through it. That doesn’t mean it’s easy, it does mean it should be fluid. It is important to remember that organic things do some difficult work. Organic doesn’t mean easy. It implies that the process is natural. Understanding the difference can be subtle and frustrating. It can be especially frustrating resistance comes from your own team, the people that are closest to you. 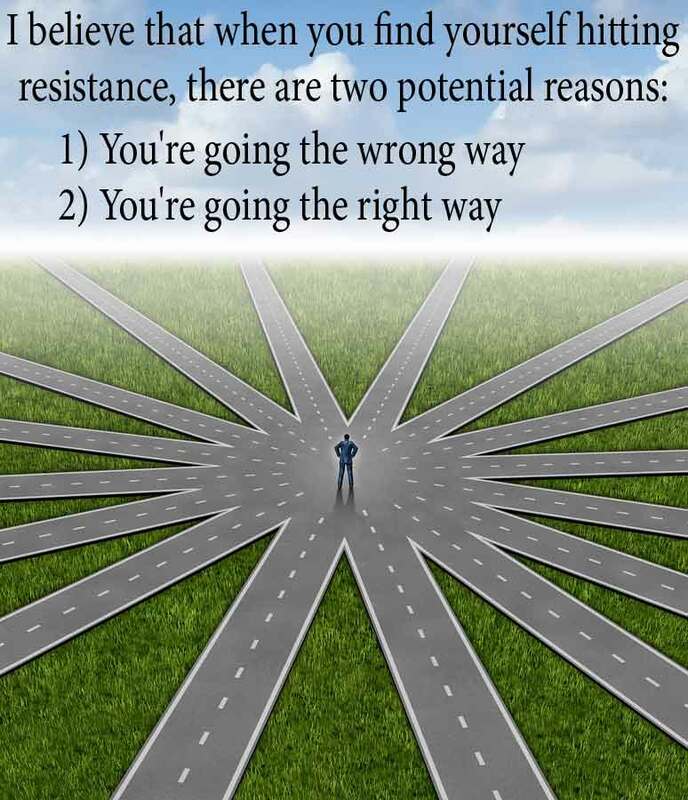 Traveling the path of most resistance is frequently not the right answer. Sometimes you are simply headed in the wrong direction. Other times you’re headed the right way, but on the wrong path. Shortly after I had moved to California, I drove up to San Francisco for a conference. I was not used to driving on busy city streets. Driving around in San Francisco can be challenging for those unfamiliar with one way streets. As I tried to find my way to the convention center I took a right turn, because I knew I needed to be somewhere in that direction. I was so disorientated though my sign reading skill had shut down. So I was ignoring the helpful signs pointing the other direction simply stating “One Way”. Not only did I turn and head the wrong direction but a massive dump truck being driven by a man who confidently knew he had the right of way, was headed straight at me. I quickly veered into a convenient driveway and waited for my racing heart to calm down. I was headed in the right direction, but on the wrong road. I was soon able to find another road that was one way, in the direction I wanted to go, and I arrived safely at my conference. Traveling the path of least resistance is frequently not the right answer. The easy thing, and the right thing, are not always the same. When you are first learning to ride a bike, the easy thing to do is to fall down get bruised and walk away. But it is certainly not the ideal thing to do. If you give up you’ll never reach the next stage, which is being able to ride a bike. You are up against a learning curve; However, Once you’ve mastered the basics of balance and learned to trust the bicycle, you’ve gained a powerful and fun life skill. You can get around a lot quicker now. Once you’ve learned how to balance the road opens up to you. Traveling under your own power is so much more efficient on a bicycle. As with all things in life, the path to success involves operating between two extremes. Finding the balance between “way too easy” and “way too hard”. As you operate just beyond your zone of ease, your skills grow and your path unfolds. If things are too easy, you lose your edge and become lazy. If things are too hard, you can’t even get started. It would be like trying to balance on a bike when you haven’t even learned to walk yet. You simply can’t make the leap and you give up. You’ve set your mark so high that you can’t even see it, let alone imagine how you could reach it. The road to success is somewhere in the middle on the moderate path. Remember when you run into resistance it can often be a sign that you’re on the right path. Trust your instincts. Listen to your gut. Follow your heart. Stay sharp.